If you visit a medieval garden in England or France any time between Spring and Summer, you will see rhubarb amongst the plants being grown. Strictly speaking, rhubarb is not a true fruit but you will usually find it in or near the fruit section of the garden. My own fruit terrace at home has a rhubarb patch bordered by cherry and pear trees, raspberries, blueberries and gooseberries. Rhubarb did not grow naturally in early medieval Europe. It originated in China where it was used for medicinal purposes for thousands of years before European travellers discovered it and brought it back along the Silk Road in the 14th century. At the time, the cost of transporting rhubarb across the continent meant that it was deemed a luxury. We know that cinnamon and saffron were prized imports from Asia but rhubarb was even more expensive. Such was the high cost of enjoying rhubarb in Europe that Marco Polo actually went looking for where it was grown and harvested in China. He found it in the mountains of Western Xia, North-West China being cultivated by the Tangut people. So let’s imagine who might have been amongst the first English people to ever taste rhubarb. Most probably it would have been wealthy merchants and aristocrats who travelled to Europe in the mid 1350’s. In terms of royalty, that could have included King Edward III of England who reigned from 1327 to 1377. Edward was not only the King of England but he also possessed the Duchy of Aquitaine with many supporters there, travelled to France and had French family. In medieval 14th century Europe, rhubarb was mainly used for medicinal purposes, commonly as a laxative. 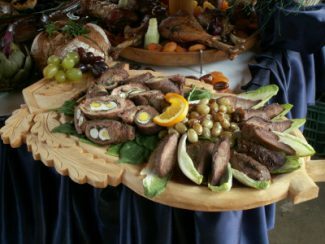 So a credible scenario for its consumption in medieval, aristocratic circles might have been a day or so following an over-indulgent medieval banquet when guests were suffering the after-effects of too much meat! Let’s look at rhubarb in a little more detail now. Rhubarb is a plant that does not bear fruit or berries – it is just stalks with leaves. The leaves are poisonous so are never eaten. Only the rhubarb stalks are used in cooking and when it comes to recipes there are plenty around. 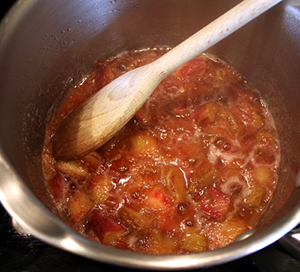 All recipes for rhubarb require sugar to counter-balance the sourness of the stalks and most recipes require stewing of the stalks as part of the preparation. 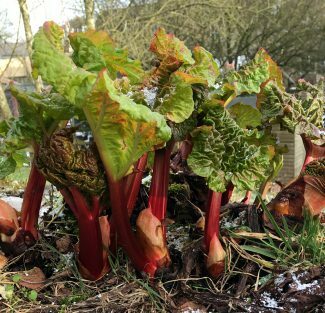 You can do many things with rhubarb stalks – stew them, bake them in pies and crumbles, make jam and even ice cream from them! 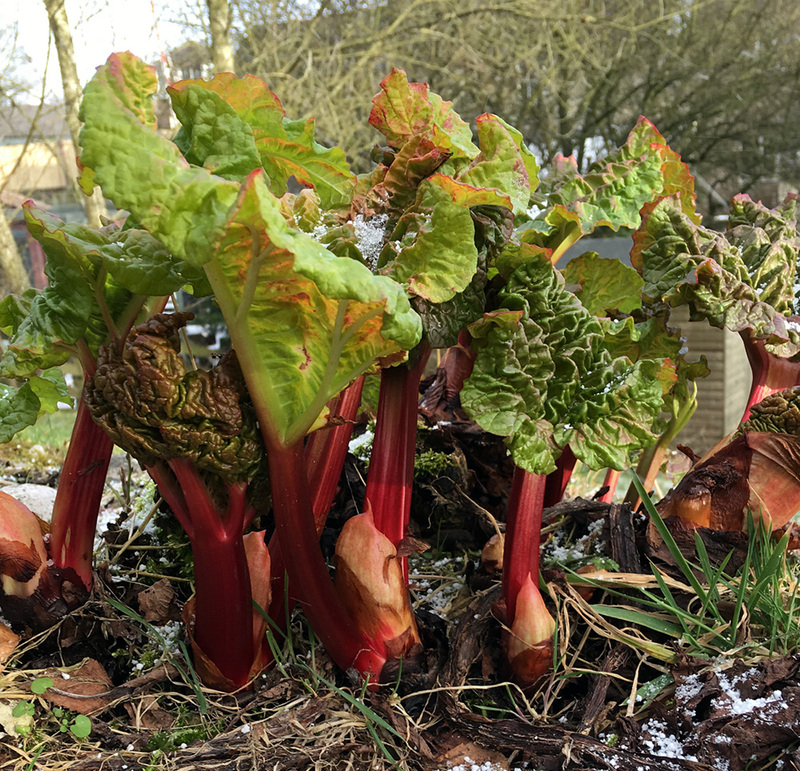 Having grown my own rhubarb for many years now, I love it served with homemade custard or in a baked crumble with a fresh dairy cream topping. I even developed my own rhubarb and custard ice cream recipe which is delicious when made from the first Spring rhubarb stalks freshly picked from the garden. One can only imagine what Edward III would have thought if rhubarb ice cream had appeared on one of his medieval banquet menus!